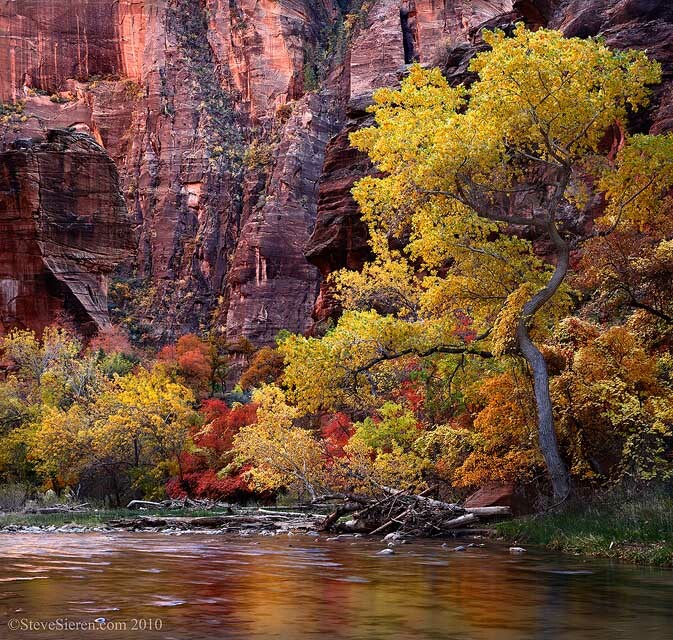 You can find many colorful scenes in Zion especially along the Virgin River and it’s tributaries. The golden cottonwoods are plentiful along the water ways so it’s common to find them with their roots running into the streams and creeks but you’ll have to do quite a bit searching to find some red maples very close to the waters edge. They add a splash of color to your Zion scene even if they are red and orange just like the walls of the canyon, at peak they pop against colors in the canyon. The large cottonwood is what initially drew me into the scene, after a student pointed it out but I couldn’t compose it into the scene the way I wanted to and include the maples and reflection so I shifted the lens and merged a couple of files in photoshop. By doing this I was able to include all 3 major elements, the giant cottonwood, red maples and the reflection in a way I found pleasing. By moving the camera you’re increasing you file size and you can easily remove the restraint of the rectangular box viewfinder or LCD. They both exclude the surroundings and help us compose but in a way the LCD and veiwfinder can be limiting so it’s best to keep your options open. This entry was posted on November 15, 2010 at 7:42 am and is filed under Uncategorized. You can follow any responses to this entry through the RSS 2.0 feed. You can leave a response, or trackback from your own site. A beautiful photograph and interesting for us to read about your creative process. Did you use a tilt/shift lens or just a bracket that allowed you to shift the lens? I like these images of Zion. Last year I was for 4 days in Zion it´s a really great place. I also stitch photos together to leave the usual sensor size. I like it to experiment with this option. Brenda, I wish I had a 65mm TS lens, no one makes one yet that I know of. After working with tilt shift lenses, you can’t help to try it with your other lenses in some sort of of similar way. The whole camera was moved. Depending on camera angle or your sensor plane, when things get further away you can worry a lot less about distortion and how things line up. Jurgen, Photoshop’s automerge does such a great job I hardly ever have to manually put the images together. Everynow and then the cloud movements create some harder to deal with problems. Nicely done. neat way to process the image. Thank you Glen, appreciate you stopping by.